Larry J. Sabato's Crystal Ball » 2014 Senate ratings: Red Alert! 2014 Senate ratings: Red Alert! We’ll grant you, most people now prefer to follow the candidates in a March 2013 election over in Rome, not the 2014 contests in the United States. But the Crystal Ball doesn’t analyze papabili and has all but endorsed Timothy Cardinal Dolan (our proffered populist yet saintly slogan for him: “He’s just like you, only better”), so you’ll have to be content with an early-bird look at U.S. Senate contenders. As we unveil our first ratings of the new Senate cycle, the key question 20 months before the election is this: What seats are in the greatest danger of flipping from one party to the other? States listed in red alert are ones where the incumbent party is at best a tiny favorite to hold the seat. These are the states where all hands are on deck, and the Klingons are opening fire. (This is fitting because partisans surely look at their opponents as ultra-aggressive warmongers.) Orange alert is where candidates are on full alert, but have not yet been subjected to serious enemy fire. We made this one up (we think), but given J.J. Abrams’ recent reboot of the Star Trek franchise, we believe that anything goes. Finally, yellow alert is where threats are not immediately evident, but vigilance is required lest one gets caught with one’s pants down or, like Capt. Kirk in Star Trek II: The Wrath of Khan, with his ship’s shields down. As is obvious from Chart 1, Democrats have a lot more places where they are on high alert. The seven most imperiled seats in the whole country are all currently held by Democrats. That includes the only seat in the country where the current incumbent party is actually an underdog: West Virginia, where Republicans are now favored to capture the seat of retiring Sen. Jay Rockefeller (D). Democrats also have very tenuous holds on two other seats: South Dakota, where even if he runs again Sen. Tim Johnson (D) will face a stiff challenge from ex-Gov. Mike Rounds (R); and Louisiana, where despite having a popular family name, Sen. Mary Landrieu (D) is likely to face a well-funded and, more importantly, sane challenger. Democrats have a firmer grip on a quartet of other seats, but Republicans should strongly challenge them in all four. Sens. Mark Begich (D-AK) and Mark Pryor (D-AR) have strong personal brands, but they also might face formidable opponents in deeply Red states. Meanwhile, Sen. Kay Hagan (D-NC) and likely Democratic nominee Rep. Bruce Braley (D-IA) will be fighting Republicans in more favorable territory, but neither can be called favorites as the GOP figures out its primary fields. 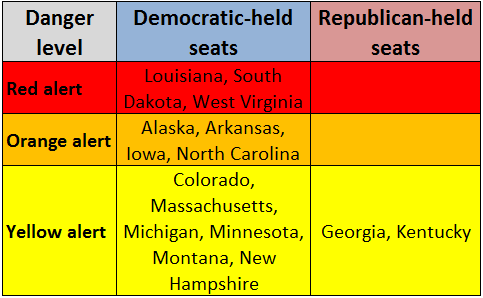 Given that Republicans need to pick up six seats to regain the Senate majority — the Democratic caucus currently has 55 members to only 45 for the Republicans — simply picking up the seven red and orange alert seats would give them the majority, but as we note in our state-by-state capsules below, that task is far easier said than done, particularly in the orange alert states. Alas, no one in the top leadership of the Democratic Senatorial Campaign Committee is named “Scotty,” but Capt. Harry Reid is going to need full power to the warp drive, and he’s going to need it now. Those Democrats without starship engineering experience are welcome to send checks. We’ll offer our full ratings for this cycle’s gubernatorial races next week, along with a red alert list for those races, which will have a greater mix of vulnerable Republicans and Democrats. Our full Senate ratings are below, in Chart 2, followed by descriptions of the state of play in all 35 races. – Anchorage Mayor Dan Sullivan? – 2010 nominee Joe Miller? (Running) – Rep. Tom Cotton? (Running) – Rep. Cory Gardner? (Running) – 2008/10 nominee Christine O’Donnell? (Retiring) – Rep. Tom Price? – Ex-Sec. of State Karen Handel? – Sec. of State Brian Kemp? – Former Sonny Perdue CoS Eric Tanenblatt? – Rep. John Barrow? (Running) – Rep. Colleen Hanabusa? (Retiring) – Rep. Bruce Braley – Rep. Tom Latham? – Activist Bob Vander Plaats? (Running) – Actress Ashley Judd? – Sec. of State Alison Lundergan Grimes? (Running) – Rep. Bill Cassidy? (Running) – Rep. Erik Paulsen? (Running?) – Sec. of State Delbert Hosemann? – State Sen. Chris McDaniel? (Running) – Rep. Steve Daines? (Running) – State House Speaker Thom Tillis? – Labor Commissioner Cherie Berry? (Running) – Ex-Sen. John Sununu? – Rep. Frank Pallone? – 2012 nominee Joe Kyrillos? (Running?) – Ex-Rep. Stephanie Herseth Sandlin? (Retiring) – Rep. Nick Rahall? – Sec. of State Natalie Tennant? – Supreme Court Justice Robin Davis? – Ex-state party chair Mike Callaghan? (Running?) – Rep. Cynthia Lummis? Note: Bolded candidate names indicate the likely frontrunner for a nomination, if there is one. *Indicates a special election. Iowa: After appearing likely to run for another term, Sen. Tom Harkin (D) decided to retire a few weeks ago, creating an open seat opportunity for Republicans. Rep. Bruce Braley (D) is the likeliest Democratic nominee, and it will be interesting to see if his entry into the race effectively clears the primary field. In any event, we do not see either of the Vilsacks — Tom, the federal secretary of agriculture and the former governor, or Christie, the former congressional candidate and state first lady — getting in the contest. On the Republican side, polling indicates a familiar and troubling problem: Rep. Steve King (R), who like Broun in Georgia is a possible second coming of Todd Akin, leads the early primary field, but Rep. Tom Latham (R), a more mainstream conservative who holds a competitive House seat and is close to House Speaker John Boehner (R), does better in general election matchups. While there are other Republican possibilities, it seems likely that one of these two would be the front-runner for the nomination. For now, this race is a TOSS-UP, but Latham certainly seems like a better option than King if the GOP really wants to win this seat. Kansas: Noticing a theme here with the Republican-held seats? Another GOP seat, another SAFE REPUBLICAN rating, this time for Sen. Pat Roberts (R). Michigan: In the Wolverine State, it’s all up to Sen. Carl Levin (D). The incumbent will be 80 in 2014 and has not indicated whether he will seek reelection. If he chooses to run, there won’t be much drama — but if he retires, Rep. Gary Peters (D) will almost surely run for the seat. While no Republican has openly declared interest, one of the state’s nine GOP House members or another Republican, such as state party Chairman Bobby Schostak, might be compelled to throw his or her hat in the ring should the seat open up. However, Michigan is still a Democratic-leaning state, so even if Levin retires, an open-seat race would be an uphill battle for a Republican candidate. While we await Levin’s decision, which may come soon, the race is LIKELY DEMOCRATIC. Minnesota: When Sen. Al Franken (D) won the closest Senate race in the country in 2008, many commentators assumed that the professional comedian would prove himself a political amateur, prone to gaffes and more focused on being heard on national television than working as a legislator. However, Franken has confounded his critics by working on numerous pieces of mundane legislation while generally refusing to speak with anyone besides Minnesota media. Maintaining a low profile seems to have helped his reelection prospects: Public Policy Polling recently found that he has a 52-42 approval rating and, in general election matchups, the survey showed Franken leading all comers, including an 11-point lead over Rep. Erik Paulsen (R) and 14-point lead over Rep. Michele Bachmann (R). Although it’s been reported that he’s not going to challenge Franken, Paulsen has twice denied such reports, refusing to rule out a Senate run. Bachmann has been coy regarding her interest in the race; given that she leads GOP primary polling for the nomination, she’s likely keeping her eyes on it, though she would be a weak general election candidate, to say the least. Franken is in a stronger position than many would have expected but until we know more, this race LEANS DEMOCRATIC. Mississippi: There is uncertainty surrounding whether or not Sen. Thad Cochran (R) will run for reelection. But regardless of whether he does or not, it’s hard to see this race in the deeply conservative Magnolia State as anything besides SAFE REPUBLICAN. Montana: Unlike his Democratic compatriot in South Dakota, Sen. Max Baucus (D) doesn’t have an obvious top-tier opponent. However, Baucus may be vulnerable in this race because of his involvement in the writing and passage of Obama’s health care law as chairman of the Senate Committee on Finance. Moreover, he has been in the Senate since 1978, and he may be reaching the point where Montanans are ready to put him out to pasture. The first major GOP challenger to announce is former state Sen. Corey Stapleton, a former naval officer and businessman. Other Republicans may get into the race, though we bet that just-elected Rep. Steve Daines (R) will pass, preferring to avoid the same fate as former Rep. Rick Berg (R-ND), who lost a Senate race in 2012 after only being elected to the House in 2010. So for now, this seat LEANS DEMOCRATIC. Interestingly, since the passage of the 17th Amendment in 1913, this seat has never been held by a Republican. Nebraska: Sen. Mike Johanns (R) is safe, unless he too has been making personal calls on state phones. Aside from any such revelation, and everything we know about him suggests he’s as clean as a hound’s tooth, this race is SAFE REPUBLICAN. New Hampshire: As of late, New Hampshire can’t seem to make up its collective political mind. In 2008 and 2012, Barack Obama won the state and Democrats won every statewide race, federal or otherwise. But in 2010, Republicans won the state’s two House seats and the other Senate seat. So will 2014 be a repeat of 2010 or more like 2008 and 2012? Sen. Jeanne Shaheen (D) hopes the latter. While it’s not clear who her eventual opponent will be, the internal conflict within the New Hampshire electorate makes this race only LEANS DEMOCRATIC. New Jersey: Incumbent Sen. Frank Lautenberg (D), who will be 90 in 2014, is considering another run. However, Democratic Newark Mayor Cory Booker wants Lautenberg’s seat. (You’ve heard of him, right? Ever watch TV?) Thus far, Lautenberg is in no mood to play Booker’s game, going after Booker’s mayoral record and wondering if he deserves a “spanking” for launching a campaign before Lautenberg had decided on his political future. If a Booker-Lautenberg showdown occurs, the early public polling shows Booker well ahead of his octogenarian party-mate. But Booker has not exactly started out this race in sterling fashion, and who knows what could happen over the course of a potentially lengthy, ugly Democratic primary battle? It’s also possible that a third prominent Democrat might also run for the seat: Rep. Frank Pallone (D). While a Democrat will be favored in most statewide federal races in New Jersey, the uncertainty in this contest makes it only LIKELY DEMOCRATIC. It’s also worth watching if Sen. Robert Menendez’s (D) recent troubles will eventually force his resignation; if he does, Booker or Pallone could run for that seat and relieve the intraparty strain. North Carolina: Sen. Kay Hagan (D) was swept into office with the aid of presidential turnout in 2008. This time around, there’s no presidential race above her on the ballot. Granted, she outperformed Obama in 2008, but turnout will certainly be down this time around, and Hagan won’t be facing off against a vulnerable incumbent (then-Republican Sen. Elizabeth Dole). For Hagan, much will depend on two factors: First, the state of the nation (Obama’s popularity, economic revival) as we get closer to Election Day 2014; and second, the Republican opposing her on the ballot. Hagan has little control over either, though she could borrow from Sen. Claire McCaskill’s (D-MO) playbook and attempt to influence the GOP primary result. Among the possible Republican candidates are North Carolina House Speaker Thom Tillis and Reps. Renee Ellmers, Patrick McHenry, Virginia Foxx and George Holding. While recent polling shows Hagan leading these potential opponents, her middling approval rating and the midterm dynamics make this race a TOSS-UP. Oregon: While Sen. Jeff Merkley (D) does not seem to be a particularly strong incumbent, Republicans have few options to run against him. Merkley won in 2008 with less than 50% of the vote and has not lit up D.C. in his time there. Still, the Republican bench is thin, so at the moment this seat is LIKELY DEMOCRATIC. South Carolina: For some time now Sen. Lindsey Graham (R) has been seen as possibly vulnerable to a challenge from the right in his 2014 Republican Senate primary. However, as of yet no primary opponent has officially stepped forward, though conservative state Sen. Lee Bright (R) sounds like a candidate. Particularly notable is the fact that none of the state’s Republican House members has decided to take on the incumbent, who has been pleasing conservatives by railing against Obama, Benghazi and Chuck Hagel. Regardless of whether Graham receives a primary challenge, in the general election the seat should be SAFE REPUBLICAN. South Dakota: With former two-term Gov. Mike Rounds (R) likely running for this seat, the home of Mount Rushmore should feature a highly competitive race. Incumbent Sen. Tim Johnson (D) has not yet formally announced his intention to run for reelection, but he has indicated that he probably will. Actually, the FEC already considers him a candidate. A Rounds-Johnson bout would be one of the marquee races in 2014, and one that Republicans really need to win if they want to have any chance of taking back the Senate. In some ways, Johnson may be vulnerable — although he’s only in his late 60s, he suffered a life-threatening brain hemorrhage in 2006 and may not be up to a competitive campaign (Johnson won against a weak opponent in 2008). Moreover, South Dakota has been strongly Republican at the presidential level and increasingly so for other federal elections. But like its neighbor to the north, South Dakota has a record of mixing and matching the partisan affiliations of its congressional delegation in Washington. This factor could help Johnson: Presently, both the at-large representative in the House and other senator from South Dakota (John Thune) are Republicans. Johnson is also chairman of the Senate Banking Committee, which could prove lucrative for his campaign war chest. All signs point to this race being a TOSS-UP, at least for now. Should Johnson retire, Rounds would become the early favorite. Tennessee: Due to his propensity for seeking compromise, Sen. Lamar Alexander (R) is viewed by some conservatives as being something of an apostate. With that knowledge, the incumbent immediately launched into his 2014 campaign following the 2012 election, eager to avoid the fate that befell long-time Sen. Richard Lugar (R-IN). Alexander has announced support from almost every major Republican official in the state and appears to be in a strong position to keep his seat. Although failed 2012 candidate Larry Crim (D) might not get robbed of the Democratic nomination by the alphabet this time around, this race is undoubtedly SAFE REPUBLICAN. Texas: Sen. John Cornyn (R) appears set to run for reelection, and the Senate minority whip is about as safe as SAFE REPUBLICAN can be. After Ted Cruz’s victory, there is some talk of a Tea Party challenge, but no impressive challenger has yet appeared and Cornyn is ready if needed. Virginia: Sen. Mark Warner (D) won this seat in 2008 by more than 30 percentage points, but he may have a tougher time winning so easily in a non-presidential year in purple Virginia. Still, Warner has a solid approval rating and recent polling found him leading many potential opponents, including Gov. Bob McDonnell (R), currently the most popular Republican in the state. Unless McDonnell decides to run (which is currently considered unlikely) or there’s a major national tide that endangers Warner, we view this seat as LIKELY DEMOCRATIC. West Virginia: Depending on how things shake out in the Mountain State, this race could wind up being wild and wonderful. Sen. Jay Rockefeller (D) has opted not to seek reelection, opening up a seat in a state that has in recent times been strongly Republican at the presidential level while remaining relatively Democratic at the state level. Rep. Shelley Moore Capito (R) seems to be the strongest possible GOP candidate, with initial polling finding her leading all potential Democratic opponents. But as has been the case in recent cycles, not all conservatives are pleased with the moderate-conservative Capito, a candidate of the Republican establishment. It’s conceivable that she could receive a challenge on her right flank in the GOP primary. Nonetheless, other potential Republican candidates have so far demurred when asked if they will challenge Capito, strengthening her hand. On the Democratic side, a wide range of potential candidates are weighing the odds of beating Capito, such as Rep. Nick Rahall, ex-Sen. Carte Goodwin and Secretary of State Natalie Tennant. Given Capito’s solid position and the ever-increasing Republican edge in West Virginia at the federal level, our bet is on her: This race presently LEANS REPUBLICAN. Wyoming: Incumbent Sen. Mike Enzi (R) has not announced whether he will run for reelection in 2014. Enzi, who is in his third term in the Senate, will be 70 years old, and his silence over his intentions has led to some chatter about who might run in his place. Liz Cheney, daughter of the former vice president, has become a familiar face at Wyoming Republican gatherings in recent months, spawning rumors that she might run for the seat should Enzi step aside. But the Cowboy State’s lone House member, Rep. Cynthia Lummis (R), would likely pursue the seat if it became open, and might well have the advantage in a face-off with Cheney. Whatever happens, the seat is certainly SAFE REPUBLICAN.